A site for a sports club. 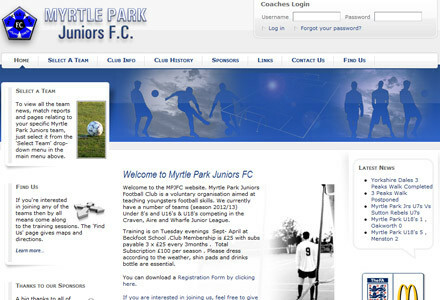 Quite clean in style and very simple to use, as we wanted to encourage the lads as well as the managers to use the site. It’s broken down into individual teams, with every manager being able to add to the News and Match Reports for his team. The site has proved to very useful as a way of disseminating information, and encouraging newcomers to come along and find out more about the club. As with most of the sites I do, there is an integrated search function that allows users to find a specific item within the site.